Recently, NBC News broadcast a couple of reports about Central African Republic. Besides telling about UNICEF’s work there, the reports also give a good overview of the current political and humanitarian crisis there. One of the languages that I’ve worked with as a linguistics consultant is Ngbugu, spoken by about 95,000 people in the Basse-Kotto prefecture in Central African Republic. The Ngbugu translation project began in 1994, but it has seen many setbacks over the years, particularly the death of several of the mother-tongue translators. In 2015, the team asked me to help them resolve some issues with the writing system (alphabet and punctuation). It turned out that Ngbugu speakers were having trouble reading the Scripture portions that had been translated. To make a long story short, we revised the way they were writing the vowels and tones in the languages. Subsequent testing showed that the Ngbugu people were able to read the language much better. The Ngbugu New Testament translation is slated to be completed in 2020. I was very happy that we were able to resolve these issues before they printed the New Testament! I would love to see Mayo publish a book based on the posters. But for the time being, you’ll have to hunt down the list in the Mayo subway! In 2015, we traveled as a family to Yaoundé, Cameroon so that I could participate in a workshop to analyze the tone systems of several languages from Central African Republic. While I was busy studying the intricacies of the Ngbugu language, Jessica worked on producing a 4-minute video about the workshop. Here is the result. Enjoy! The first song on Let the Nations Be Glad is a new rendition of the classic Easter hymn, “Christ the Lord Is Risen Today,” by Charles Wesley. Click below to listen, and to see the lyrics! Jessica and I have just released a new music CD, entitled “Let the Nations Be Glad”! 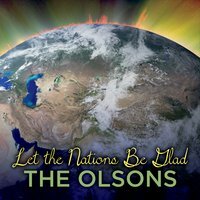 You can preview or purchase it from http://www.cdbaby.com/cd/theolsons2. In addition, it’s available on iTunes and Amazon. Finally, check out our new music website: http://www.olson-music.com! From 1993 to 1995, I (Ken) lived in the town of Bili, in the northwestern corner of the Democratic Republic of the Congo (at the time known as “Zaire”). The sojourn left an indelible mark on my life, which I remember with great fondness.